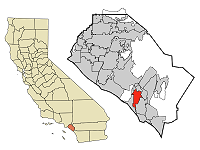 The city of Aliso Viejo, California is located in South Orange County, CA. The master-planned community became Orange County's 34th city on July 1, 2001. The city is known for its great public schools, beautiful parks, stores, employment and entertainment opportunities. Being only minutes from the Pacific Ocean, Aliso Viejo enjoys the cooler weather that is associated with coastal locations. All homes are located close to the business and recreational focal point known as the Town Center. This wonderful facility features restaurants, shopping, and entertainment. The city is also the headquarters of many corporations, including several high-technology companies. Aliso Viejo offers a wide variety of homes and real estate in many price categories. These include affordable real estate and homes, which are ideal for first time home buyers. There are also luxury properties and spacious executive homes. I can help you buy, sell, or lease a home in Aliso Viejo! Use the following links to search for Aliso Viejo homes, houses, and real estate for sale, lease, lease-option, or rent. Properties include single family and detached homes, condos, town homes, executive estates, bank owned and REO properties, foreclosures, pet-friendly leases, single story or single level homes, seller financed properties, short sales and distress properties, owner financing, homes with no Mello Roos, and homes with pools or great views. You may also search for homes by price range. Condominium complexes include Camden Park, Canyon Villas, Coronado, Windsong, and Heather Ridge. Single family home tracts include Hamptons, Kensington, California Summit, California Reflections, and Key West, to name a few. Homes, houses, and real estate for sale in Aliso Viejo, CA. Newest link are the live/work units in Aliso Viejo with a residence on the upper floor and retail space on the ground floor. Homes for sale with Panoramic Views . Condominiums and Town Homes for sale . Bank Owned (REO) homes for sale . Homes with No Mello Roos fees . Short sales in Aliso Viejo . Aliso Viejo High Resolution Floor Plans Available! A floor plan shows the layout of the entire home, not just part of it. Floor plans reveal the proportions of rooms, the number of rooms and the traffic flows among them. A buyer can instantly see, for instance, if the kitchen is conveniently close to the dining room, whether bedrooms open directly onto an entertainment area, or whether a trip to the guest bathroom will involve a long walk through the home. I can provide you with complimentary, high resolution floor plans for any standard builder home or condominium in Aliso Viejo or other area of South OC. These are e-mailed to you, usually with 24 hours of your request. Just click on the link below, and be sure to specify the city of the tract that you are interested in. Please note that as of Jan 1, 2012, we are now being charged for each floor plan. We are still happy to send you a floor plan, but please DO NOT request a floor plan if you are an appraiser, if you are not serious about buying or leasing a home, or if you are working with another real estate broker -- Thank you for your understanding! Aliso Viejo condominium and housing tracts include: Alta Vista Westridge, Altisse, Applause, Aurora, Birch River, Breeze Pacific Ridge, Calabria. California Renaissance, California Summit, Cal Reflection, Camden Park, Canterbury, Cantora, Canyon View Estates, Cape Series, Carmel, City Walk, Coronado, Cozumel, Crest, Crest Pacific Ridge, Eagle Pointe, Flores Los Alisos, Glenwood Park, Glenwood Terrace, Glenwood Village, Greystone Colony, Hamptons, Harvest, Heather Ridge, Highlands Pacific Ridge, Hillcrest Audubon, Hillsborough, Horizons, Islands, Kensington, Key West, Laguna Vista Audubon, La Mirage, Latitudes South, Laurelmont, Lyon Ridge, Memory Lane, Montelena, Morningside, Morningside Terrace, New World Condos, Oakview Westridge, Orleans, Pacific Grove, Palisades Pacific Ridge, Passeggio, Pinnacle Pacific Ridge, The Pointe, Promenade, Provence-D Aliso, Ridge Pacific Ridge, Rondondela, San Simeon, Seacliff Court Audubon, Seacoast Terraces Audubon, Seacove Place Audubon, Seacrest Seascape Ahston, Seaway Collection, Seawind Ridge Audubon, Silver Oaks Westridge, Skyline Audubon, Skyview Westridge, Soleil, Talavera, Talus, The Cottages, Tiburon, Tivoli, Tropez, Twelve Picket Lane, Ventana Ridge, Victoria, Villas, Villas South, Vista De Oro, Vista Heights, Vista Plaza, Vista Pointe, Vista Ridge, Windflower, Windsong, Windwards, and Woodlands. If you are interested in information, listings, or comparables for any of these developments, just call me at (949) 290-3263. Aliso Viejo contains many award winning public schools. These include Canyon Vista, Don Juan Avila, Wood Canyon, and Oak Grove Elementary schools, Aliso Viejo Middle School, and Aliso Niguel High School. There are also a number of private or charter schools and early childhood programs. Information on private schools in the city can be found here. Soka University, California's newest private four-year liberal arts college and graduate school is located in this city as well. School ratings for the city are here and here. Property taxes in Aliso Viejo consist of the base 1% tax rate, plus special assessments and Mello Roos, where applicable. The rate is based on the purchase price of the home, and is paid twice per year. The property tax breakdown for a specific home can be found on the Orange County Treasurer, tax collector's web site, here. Since Aliso Viejo is largely a newer community, most of the homes include Mello Roos assessments. There are some homes however, that are free of Mello Roos (see Home Search above). HOA (Home Owner Association) dues vary by community. These fees are used to pay for fire insurance, common areas, security, or other services. I will be happy to provide you with specific property tax, Mello Roos, or HOA dues on any home in Aliso Viejo, or other areas n Orange County, CA. The Aliso Viejo Community Association (AVCA) was established to provide a wide range of services to the city, including recreational and youth programs. These include: AVCA Youth Commission for Teens, dance classes, CPR training, Summer Youth Drop-In park programs, youth sport camps, tennis lessons, T'ai Chi, dog obedience, adult and youth golf lessons, yoga, and more. Youth sports programs include little league, girls softball, and AYSO Soccer, to name a few. For the slightly more mature, the Aliso Viejo Country Club includes a Jack Nicklaus designed,18-hole public golf course. Aliso Viejo is also known for its mountain biking and hiking trails. The Aliso and Woods Canyons wilderness park is approximately 4,000 acres of natural open space, and is open to the public. The Aliso Viejo Ice Palace is a large, indoor ice skating facility that is used for freestyle skating, adult hockey, and other events. Please call me if you are interested in Aliso Viejo homes or real estate. I will happy to help you find a home for sale, lease, lease-option, or rent in this city. I can also assist you in selling your home. If you are interested in relocating, I will keep you updated with MLS listings. Investors - Aliso Viejo real estate also includes short sale and bank owned real estate opportunities. Call me for a list!